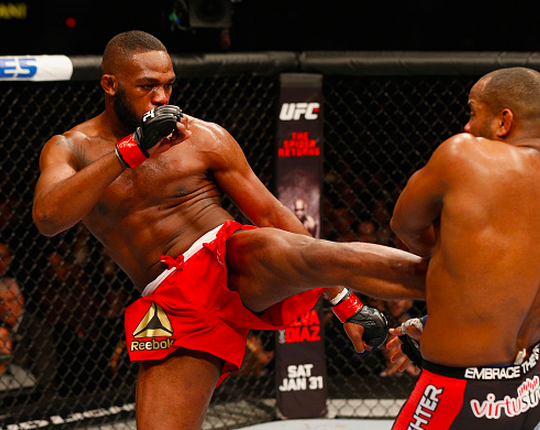 Jon Jones outlasted bitter rival Daniel Cormier over a unanimous decision win to keep his Light Heavyweight crown in Vegas at UFC 182. Before a great main event, Donald Cerrone was a firm roadblock as he topped Myles Jury. Brad Tavares side-stepped the biggest name to challenge his career as he breezed past Nate Marquardt in a cautiously-approached Welterweight tilt. A trend of lack of finishes saw Horiguchi get the better of Gaudinot, while Lombard was no match for Burkman. We had live coverage around the clock as the new year braced the Ultimate Fighting Championship. You can view all our coverage below. UFC 182, as it happened - with Jon Jones over-coming Daniel Cormier to retain Light Heavyweight Gold in a clash of bitter rivals.